PHOTO BY STEVE E. MILLER SHOW ME YOUR PAPERS : In the midst of campaign season, a sudden change has the SLO Downtown Association demanding current and prospective political vendors at Thursday night’s Farmers’ Market, such as mayoral candidate Don Hedrick (pictured), show proof of liability insurance. In recent weeks, locals who staff political and nonprofit booths at the popular San Luis Obispo Thursday night Farmers Market have been notified by the Downtown Association (DTA) that they need to show proof of their $1 million liability insurance policy, which the association says is required for all in order to operate as part of the weekly event. A number of prominent booth operators with a lengthy history of participating in the event say they’ve never been asked to show proof of insurance until recently. Some vendors are wondering what’s behind the sudden need to have a policy on file with the association. Donald Hedrick, one of four candidates running for San Luis Obispo mayor in the upcoming Nov. 2 election, has his suspicions. Hedrick, by his own admission, isn’t your typical mayoral candidate. 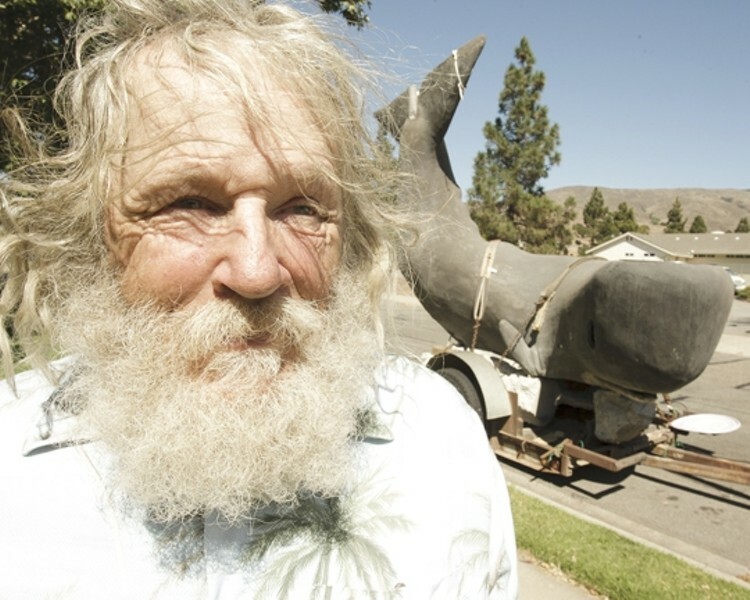 He’s outspoken, he occasionally totes around a massive model whale formerly housed on a Morro Bay sidewalk, and he has a bushy, sandy-blond beard resting atop his consistently casual attire. In an effort to promote his candidacy, Hedrick said he’s been jumping through hoops for nearly two months to secure space for a booth at the Thursday night Farmers Market. On July 15, Hedrick filed his nomination papers with the city clerk, as well as an application for a Farmers Market booth—as he did when he ran for mayor in 2006. Back then, he said, he had no trouble with the association and he set up his booth for eight consecutive weeks without incident. Roughly a month after his application was submitted for review this go-round, however, Hedrick said he was told he needed insurance. He said his understanding at the time was that he would be required to show proof of insurance after his application was approved. Then Hedrick learned that other long-operating vendors didn’t have insurance on file with the DTA—and to their knowledge had never been asked. He filed a complaint with the California Fair Political Practices Commission (FPPC), alleging he was being singled out by the association for his political platforms and unconventional style. “It’s an issue of discrimination when they’re not having an equal distribution of this policy,” Hedrick said. Such discrimination in participation is prohibited, according to the DTA’s website. The requirement for insurance is included on the application form, but isn’t listed on the “Rules and Regulations” section of the site. Shortly after the complaint was sent to the FPPC, a number of political and nonprofit vendors were approached by DTA Event Coordinator Diana Cotta, who told them the association couldn’t locate their proof of insurance and that they’d need to submit it, vendors told New Times. Hedrick took his grievance to the City Council on Sept. 7.
the face of the complaint being filed,” he told councilmembers. However, Ashbaugh added that the DTA wants to be sure they apply the same standards as the Farmers Market Association (FMA), which requires insurance for produce vendors. SLO City Attorney Christine Dietrick said the DTA is within its rights to require insurance of political vendors if they wish to officially take part in Farmers Market, an event organized, administered, and paid for by the association. Asked why other vendors have never been told they needed insurance prior to Hedrick’s contentions, Dietrick said only the DTA could answer that. However, the DTA isn’t talking. Neither Executive Director Deborah Cash nor Cotta responded to repeated requests for comment. Indeed, until roughly three weeks ago, booths that had “slipped through the cracks” included such regulars as the SLO County Democratic Party; the SLO County Libertarian Party; and the Central Coast chapter of Parents, Families, and Friends of Lesbians and Gays (PFLAG). Gary Kirkland, who has operated the Libertarian booth for more than four years, said his party doesn’t have insurance on file, nor does he believe it should. Other vendors seemed confused when asked if they had their insurance on file. Real estate broker Sean Lee said he didn’t know but guessed he must have it, because he’s been there for eight years and has never been contacted. Rich Besco, one of the operators of the 9/11 Truth booth, said he didn’t know, either, and hasn’t been asked. Some vendors were familiar with the requirement. People staffing the Republican Party of SLO County and the Islamic Society of SLO County booths told New Times they provided insurance to the DTA. Hedrick said the latest quote he was given was approximately $1,000 for a $1 million policy for 24 hours of exposure, which would cover eight weeks at Farmers Market.